The Official Guide to Squarespace SEO: the best SEO tools, tips, resources, strategies to optimize your Squarespace site for Search Engine Rankings, and increase your search engine rankings. This SEO beginners guide to Squarespace also answers questions such as is Squarespace SEO friendly and good for SEO, how you can optimize your Squarespace website, and who wins between Squarespace vs. Wordpress. Squarespace SEO and marketing guide. If you are about to launch a site on Squarespace, you’ve probably consider how you should market your website with the best SEO strategies to make your website rank higher on Google and search engines. We have spent hundreds of hours of research and content writing to develop this official guide to Squarespace marketing and SEO. Our advice: be sure to read all the way to the bottom, and share this link with your colleagues. Bottom line, if you’re using Squarespace, these SEO tips will help your site rank higher and receive more organic traffic. The website builder is one of the most popular, and thousands of businesses launch their websites using Squarespace every month. Fortunately, Squarespace is built for SEO. Sites created on the platform have a strong technical SEO foundation. Squarespace sites are fast, have clean architecture, utilize industry-standard security, and are mobile friendly. These all happen to be key Google ranking factors. And fortunately, that’s all set up for you out-of-box. Yet, beyond a strong technical foundation, content optimization is still a Squarespace site owner’s responsibility. But if you incorporate keyword and on-page SEO into your content, your Squarespace site will rank higher in search. Need some Squarespace SEO help? This SEO Guide for Squarespace gives you practical SEO strategies, tips and tools for ranking your Squarespace site higher in Google search results. How do I optimize SEO on Squarespace? Is Squarespace easy for beginners to learn? If it were between Squarespace vs. Wordpress, which is better for website design and SEO? What are the best tools and software to optimize your Squarespace website? Can you use Yoast with Squarespace? How can you get started with Squarespace analytics and marketing tools? How to Optimize Your Squarespace Site for Traffic, Leads, and Conversions. Squarespace templates are designed to rank in Google search results out-of-box. Unlike Wordpress, Squarespace doesn’t have back-end SEO tools and plugins that help improve SEO. But Squarespace allows easy integration with three of the world’s most popular SEO tools: Google Search Console, Google Analytics and Bing Webmaster Tools. Integrating these tools into your Squarespace site’s backend puts metrics at your fingertips, allows you to analyze your traffic, and provide insights into your SEO performance. Best SEO guide for squarespace. This Squarespace analytics report provides great insights into the search terms people use to find content on your site. Plus, you can quickly see average position for each term, and the number of clicks each term generates. SEO Tips for Google Search Console and Squarspace: Follow this guide to linking Google Search Console and Squarespace. how to setup google analytics with squarespace. Squarespace allows you to quickly connect your Analytics account with your Squarespace site. Synching your site’s ensures that all of your traffic data is sent to Google Analytics. This data isn’t available in the Squarespace back-end; you’ll have to log into your Google Analytics account to view it. But the free SEO tool for Squarespace provides tons of valuable data, including engagement metrics (bounce rate, session time), conversion stats, traffic sources, and paths customers take on your page. SEO Tips for Google Analytics and Squarespace: Follow this guide to setting up and connecting Google Analytics with Squarespace. Bing Webmaster Tools is similar to Search Console, but provides insights into your performance in Bing Search. Synching these accounts allows you to capture traffic stats, conversion data, and performance metrics in your Bing Webmaster Tools account. SEO Tips for Bing Webmaster Tools and Squarespace: Follow this guide to verifying your Squarespace site on Bing’s Search Engine. how to setup squarespace analytics. Every site created on Squarespace has a built-in analytics tool, with stats available on the backend. With this tool, you can quickly see your most popular content, track traffic growth over time, and monitor sales and conversions. Tips for Squarespace Analytics: Squarespace Analytics is included in every site. All of this data is available in the Squarespace Analytics panel. Why are Squarespace Analytics important? Analytics allow you to make better business decisions. Analytics give you the key to understanding your website traffic. Analytics let you see what keywords are converting. Analytics give you an inside view of where your leads are coming from. Analytics allow you to optimize your website for the next in-bound customer. Squarespace seo toolbox and guide to optimizing your squarespace websites. Within days of us publishing this review on the best Squarespace tips, tools and SEO optimization, Squarespace launched its new SEO functionality. The following popup is a link from the startup web development company, Angel Kings. The ability to see the Search Results Preview (What Google sees when your site is indexed). The ability to add your SEO title for the page results. The ability to add a 400-character description to your page so that people know what your page is about and whether or not it’s relevant. A new URL “Slug” on Squarespace that gives you the opportunity to modify the primary URL for your business’ website. Pro Squarespace SEO Tip: Use this new toolbox wisely. Add the most relevant short-tail and long-tail keywords for your page. Keep updating this every 4 to 6 months so that Google knows whether your Squarespace site is static, or dynamic and changing. The latter which is better for your SEO efforts. Check the Traffic Overview report to gauge the effectiveness of your marketing efforts and traffic growth over time. Check Button/Form Conversion report to see if your Calls to Action (CTAs) are generating clicks/leads. Check the Sales Overview report to see daily, weekly or monthly sales. The Sales by Product report provides a look at your most popular products. Explore the Traffic Sources report to see what is driving traffic, e.g. Facebook, inbound links, organic search, and more. This will help you gauge the effectiveness of your off-site marketing and SEO efforts. Check the Popular Content report to see which pages/blogs generate the most page views; use this to optimize your most popular content and incorporate lead-generating features into each page. Which is better and how to install both for your Squarespace site? How effective is Squarespace Analytics? Do I really need to incorporate Google Analytics as well? How does Squarespace’s analytics compare to Google’s? That’s a question lots of Squarespace site owners will ask. And the short answer is yes. Squarespace Analytics provides a great overview of your traffic, while Google Analytics is the perfect tool for in-depth analysis. Use Google Analytics for: In-depth traffic analysis, content auditing, and conversion funnel optimization. In Google Analytics you get richer insights into your traffic, like session time, pages per session. This can help identify content marketing opportunities. The tool also offers a deep dive into conversions, allowing you to better track cost per lead, examine your funnels, and fine-tune your conversion efforts. Use Squarespace Analytics for: A quick overview of your website’s traffic and sales. Squarespace Analytics is ideal for quick estimates of your traffic, to understand form/button conversions, and get a quick picture of sales data. Although you can glean insights from these reports, Google Analytics is better for going deep and doing in-depth analysis. There are a number of developers that sell custom features and graphics that can be used on Squarespace sites. Although these don’t directly affect SEO, they can help you create a better on-page experience and keep people on pages longer. Pro Squarespace SEO Tip: Third-party customizations are an easy way to make your website content more engaging. Keeping people on pages longer can help you earn higher rankings. So, you’ve integrated your SEO tools, now what? A key to ranking your Squarespace higher in Google search is effective on-page SEO. On-Page SEO – The process of optimizing each webpage to generate more targeted traffic and earn higher rankings in search results. Fortunately, most of the heavy lifting is done for you. You can quickly design and launch an elegant website that check all the technical SEO boxes. But there are some on-page design and strategy tips that can help you improve your SEO for your Squarespace site. TIP #1: How to Rank Your Squarespace Website Higher on Google. All Squarespace templates, except Wells, include a customizable footer section. This is a valuable real estate on your site. Some elements you should include in your footer: Your business’s name, address and phone number, as well as navigation links. Squarespace: best tools, tips, and strategy for SEO and Search Engine Rankings. how to fix 404 error on squarespace. 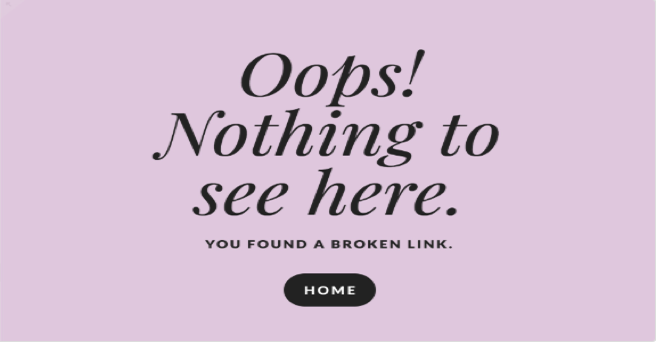 how to create custom 404 error page for squarespace. Pro SEO Tip: Link to helpful resources or your homepage on a custom 404 Page. This will help keep visitors engaged. Link your Squarespace website 404 page back to one of your most important pages. For Vail Networks, we send any 404 errors and issues to Contact Vail Networks. Your business can do the same. But whatever you do, address this issue now so that you can optimize your Squarespace website for maximum visibility. How to Add Squarespace Favicon. Fortunately, adding a branded favicon is fairly easy to upload. Pro Squarespace SEO Tip: Favicons are either 16x16 pixels or 32x32 pixels. Use a high-resolution image to ensure it appears crisp on the page. Why is a Squarespace Favicon Important? because your website brand “logo” deserves full-attention as people share your website on social media and across the web. because you want to visitors to see the best of your website images, from top-to-bottom. 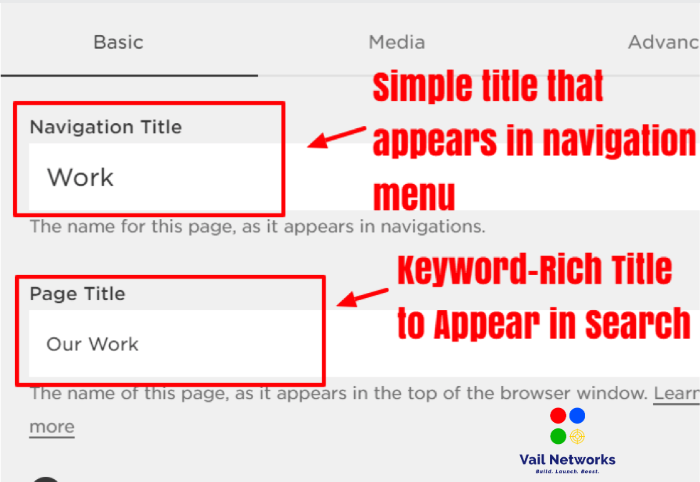 because according to best User Interface (UI) and User Experience (UX) experts at Vail Networks, customers look to the top left of their browser before searching for more information about your website. Out of box, Squarespace sites are designed for speed. Pro Squarespace SEO Tip: Images can have a dramatic effect on load speed and mobile performance. Reduce file sizes before publishing your site. A streamlined navigation bar should feature 4-6 pages. Just remember: Keep it simple. Adding too many navigation elements can slow down your site, and disrupt the user experience. How to Setup Navigation on Squarespace. 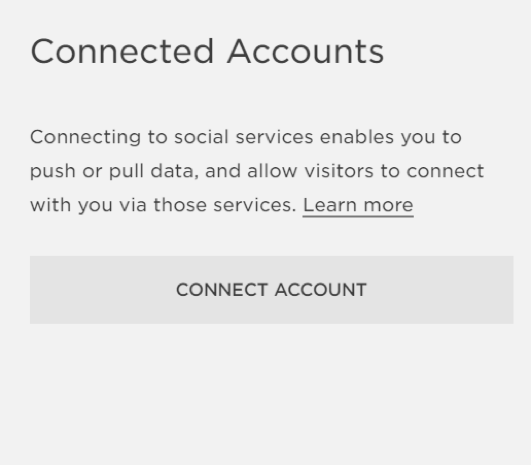 How to Connect Social Media to Squarespace. Your social media presence can help reinforce your rankings and provide valuable traffic to your site. Be sure you link all relevant accounts. By successfully connecting your social media accounts (Facebook, Twitter, Instagram, Pinterest and more) to Squarespace, you give yourself the opportunity to automatically post all of the content across the vast web of social media followers and can build an audience of website traffic to your Squarespace website. Keyword strategy forms the basis of SEO. Choosing the right keywords will help you rank higher for the most relevant search terms, which drives the most relevant readers to your site. Squarespace makes it easy to optimize webpages per keyword. An effective keyword strategy should include a main target keyword per page. Each page, though, should include clusters of related words. how to select best keywords for your squarespace website. Squarespace: How to Use Categories and Tags. Why are Categories and Tags Important for Your Squarespace Site? Because by adding these tags and categories, they not only are added to your meta information for your website (which helps with Search Engine Rankings), but they also allow you to better organize the content of your website so that it is easier to organize your content in the future. Pro Squarespace Tip: Keep it simple. Provide just 1-3 super relevant tags to your content. Too many tags can confuse and overwhelm readers. Website owners need to practice on-page SEO and utilize keywords strategically throughout the site. Where to start? There are several elements on each page of a Squarespace website that should be optimized for search. Squarespace uses title formats to auto generate titles for each page. These are the titles that appear in Google search results and in browser bars, and they help search engines understand what’s on your page. Customize each of your Squarespace pages to include keywords that are most relevant to your business. Pro Squarespace SEO Tip: Use your keywords as near to the front of the title as possible. The navigation menu does not need to be keyword-optimized; instead, use a simple descriptive word or phrase. The URL slug is the bit of text that appears after the slash. Using keywords in the slug helps Google understand what’s on the page. Meta descriptions are brief synopses of the information on each page. Although these don’t have a direct result on SEO, they do encourage users to click on your pages when they appear in search. Pro Squarespace Tip: Meta description keywords appear in bold in search results. Use one or two keywords naturally to take advantage of this part of Squarespace for maximum effect and better search engine rankings. In both of these sections, use keywords for a search engine boost. Pro Squarespace SEO Tip: Avoid keyword stuffing in your image metadata. Write natural descriptions that use keywords naturally. Finally, it’s important to use keywords in the body content of each page and create a hierarchy. Use your target keyword in your H1 title tag, then secondary keywords in H2 and H3 sub-headers. Pro Squarespace SEO Tip: Fit 2-3 internal links into a piece of content. You can link to related content or content that you want to promote. You can integrate a blog into almost all Squarespace templates. Regular blogging is one of the fast ways to generate an audience for your site. First, start by producing content that’s valuable for your niche, e.g. guides, how-tos or case studies. Promote your work on social media to generate interest. And finally, add internal links between related pieces of content. Pro Squarespace SEO Tip: Focus on publishing long-form content (2,000+ words) that people will want to share. For local businesses that target customers in a specific city, website owners need to conduct local SEO to appear in the right searches. Local SEO is the process of adding location data to your website to help search engines understand where your business is located. Squarespace includes a few areas where you can bolster your local SEO presence. How to update your business information on squarespace. You can update this within Squarespace’s Settings panel > “Business Information”. See image to the right for how you can update your business settings/information quickly on Squarespace. NAP Consistency Matters. The consistency of your address, business name and phone number listings across the web – on your site, as well as online yellow page directories – is very important. For example, if you use Avenue in one instance don’t use Ave. in another. If you use Black & Tax Leatherworks, don’t use Black and Tax Leatherworks somewhere else. Map Blocks in Squarespace allow you to easily add a Google Map to your website. Adding a map helps Google understand your location in relation to customers who are searching for your business. How to Setup business location on squarespace. Your Contact Us page or a CTA at the bottom of your homepage are great places for maps. The following to image on the left is an example of how to setup your business’ location on Squarespace (Hayden Template). provide the most updated business address, zip code, phone number, and we even recommending adding your hours of service beneath the Map Box. How to add your business information to squarespace site. You can add a text box to your footer section and add your business address, phone and other contact information. Making your NAP accessible is a trust indicator; Google rewards sites that clearly display this information. Within the “Footer” Section of your website. On your primary “Contact page”. If you are a local business, on your homepage using the Map Box function of Squarespace. How to create a contact form on squarespace. Your Contact Us page doesn’t need tons of content. Instead, it should help people easily get in touch with your business. In addition to utilizing contact information, you might embed a contact form, which allows visitors to send you an email. You can input a form by inserting a “Form” on your contact page. Pro Squarespace SEO Tip: You should include NO more than 4 fields on your contact form. Including any more than 4 will drastically reduce your lead conversions. In fact, by having 4 fields or less, you increase your chances of conversion by 33%. How to optimize product description for squarespace. Pro Squarespace SEO Tip: Use keywords and keyword synonyms throughout your product copy. But keep it natural! how squarespace helps you prevent abandoned shopping carts. Abandoned Cart recovery is an advanced feature. Essentially, it allows you to send an email reminder to existing customers, if they’ve shopped on your site and left items in their cart. What you will notice is that Squarespace gives you tools to send customers who abandoned their shopping carts an email encouraging them to come back and complete their purchase. Why is the Squarespace abandoned shopping cart feature helpful? Because more than 80% of shoppers abandon their shopping cart in any given day. Because once you have a shopper “adding product” to their carts, your chance of having them complete the purchase goes up significantly. Pro Squarespace SEO Tip: Test the timing of your email notifications. You don’t want to immediately send an update; instead try 12-hour or 1-day notifications. Add categories tags to your products. You can choose to display these tags as a navigation element on your product pages. This helps customers sort products. Pro Squarespace SEO Tip: Use simple 1- to 2-word category names; these don’t need to be optimized. Instead, they should provide a helpful for navigation. 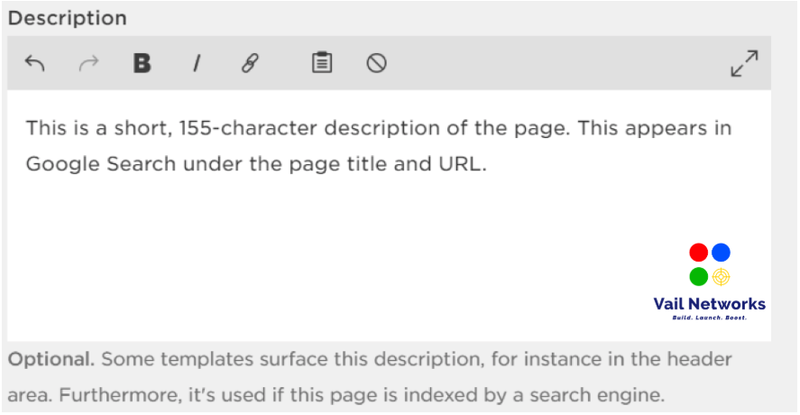 How to Write and optimize Product Titles And Meta descriptions for squarespace. Optimize product pages with targeted keywords, e.g. men’s red sneakers. Additionally, you using the exact product name in the copy can help your products standout in search. Your main H1 header should be the product name. You might also test a short keyword phrase as well. Use product image alt text as a way to show Google what’s in the image. You should use targeted keywords in your image alt text on product pages. Squarespace offers users many SEO advantages. The platform helps anyone build technically-sound sites that are designed to get found by Google. But when it comes to content, the site owner is responsible for optimizing text, images and on-page elements to generate maximum search volume. All of these Squarespace SEO tips will help. Whether you’re about to launch a site, or you want to generate more traffic to an existing Squarespace site, these tips will help you rank higher, faster. There are so many website builder platforms - from Squarespace, Wordpress, Wix, Shopify to BigCommerce (and more). However, Squarespace is one of our favorites for search engine optimization. One of the best things about Squarespace’s SEO tools is that they are already integrated into the monthly subscription. This means for a low price, you can get all of the SEO resources you need including things such as the Squarespace Map Box to easy-to-add Meta description and Product Title sections on your site. Yes, Squarespace’s platform is SEO friendly. When you think of the term “friendly” you must determine whether or not the site is “user friendly” in that any beginner, intermediate, or advanced marketer could use Squarespace’s features effectively, to optimize his or her site. We have built many sites on Squarespace (including Vail Networks’ primary site) and can tell you that Squarespace is an easy-to-use, simple website creator that allows for great SEO and digital marketing for companies of all sizes. For most beginners, yes. However, like any website builder you do need to be patient and try several things before diving into your SEO. At our company, Vail Networks, we recommend you set-up a sample “test” website for free on Squarespace. You can use the tips and recommendations for Squarespace SEO above, and then try to build a site that gives you a better understanding of how SEO works with Squarespace. By doing this, you won’t have as much external pressure and it will ease you into the process of making your business’ website the most professional site possible. And as always, we are here to help you with your Squarespace websites. For beginners to intermediate web developers and designers, we recommend Squarespace. Squarespace is just easier for basic SEO and set-up compared to Wordpress, which has a higher learning curve for developers. For intermediate to advanced web developers and designers, we recommend Wordpress. Wordpress has more plugin options and is more customizable overall for businesses. The same SEO principles and rules apply to both, but Squarespace is just easier to get started with SEO. If you are searching for the best SEO tools and resources, first go through our official list and see which might help you with your Squarespace website. Once you have reviewed this list, then login to your Squarespace account and using our Official SEO guide above, go through our checklist and make sure you have applied all of our optimization tips and strategies. How can you get started with Squarespace analytics and marketing to improve your search engine rankings and increase your website traffic? We recommend that you get started with your Squarespace analytics and marketing by linking your Google Analytics account directly to your Squarespace account. You should also make sure that you have your Google Search Console up and running properly. Once you have verified these accounts using Google’s verification process, then start monitoring your website traffic every day. And if you aren’t seeing the results you want (and need), then get in touch with Vail Networks for help with your Squarespace and Digital Marketing. No, you cannot use Yoast’s plugin for Squarespace. You can however, use Squarespace’s built-in SEO tools to optimize your website. What Squarespace SEO strategies can help my site rank higher in Google search? Complete all of your website’s listing and business information within settings. Add your company’s brand assets (Logo, Slogan, Mission) into the bulk of your website content. Select 5 to 10 keywords (mid to long-tail) that fit your business’ description. Add your social media links to your site (header and footer). Market your website content within your industry and through social media (Instagram, Linkedin, Facebook, Twitter). Repeat until you begin seeing search result rankings improve. 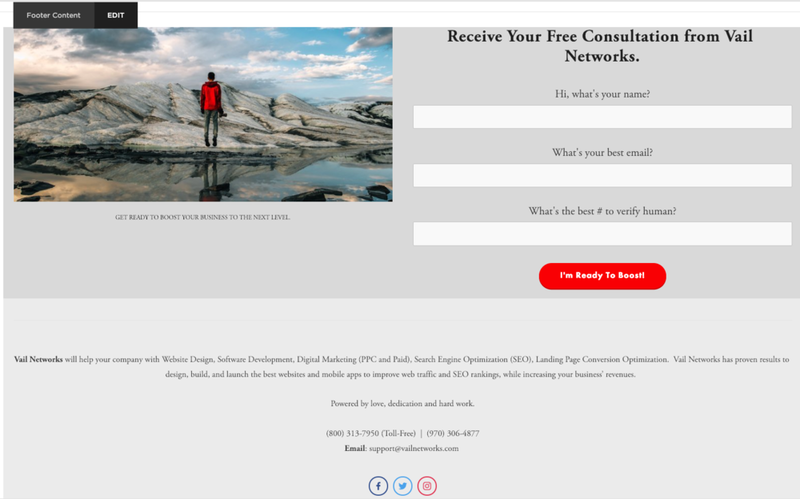 and of course, contact Vail Networks to get help with your Squarespace optimization.